The Maze Bar Stool White is a modern and highly practical piece of furniture that will fit perfectly in a range of locations. Showcasing minimalist style whilst remaining incredibly comfortable, the Maze Bar Stool is a wonderful choice for the home. 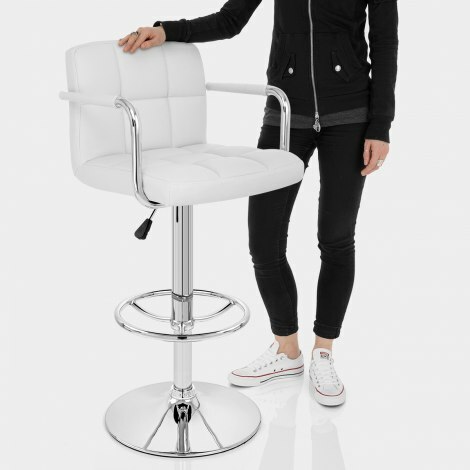 The high-density foam padded seat is covered in white faux leather, with a contemporary grid pattern is both comfortable and supportive. 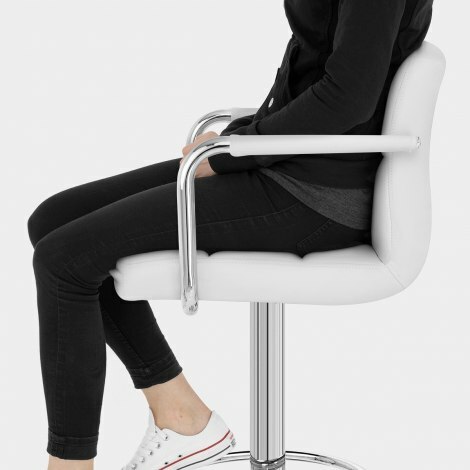 The moderately high backrest offers good support, aided further by the additional armrests at either side. With the additional luxury of a cushioned section for higher levels of comfort, these armrests reflect the appearance of the frame in a chrome-plated finish. 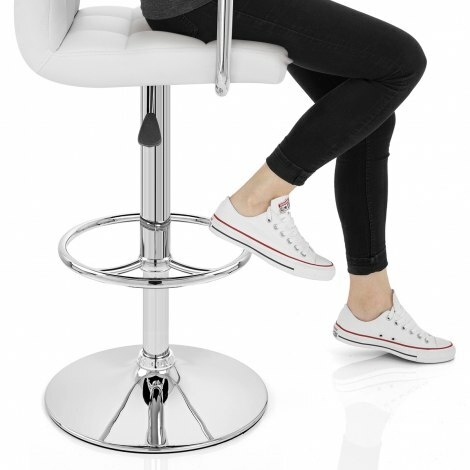 The circular footrest ensures a sturdy place to rest your feet, whilst the gas lift mechanism enables you to raise or lower the stool to your desired height, or rotate up to 360 degrees. The circular chrome base provides the perfect amount of support, whilst still protecting your floor with a circular protector. "These tick all the boxes and arrived promptly"
Two lovely bar stools delivered within a day. Look more expensive than they are. Confident they will last well as I had two 9 years ago, and they are only just showing signs of wear. They are used every day. Easily assembled, easy to order, excellent service. Thank you for the super fast delivery. Stool was extremely easy to put together and looks really stylish! We are delighted with our three white bar stools. It was brilliant to be able to try out many types of stool in the showroom. All staff were most helpful and friendly. Thank you very much indeed.